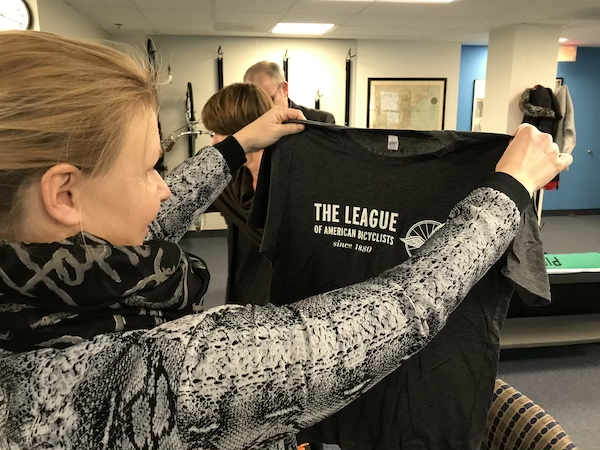 Yesterday, the League hosted Jan and Ine of Mobiel 21, based in Leuven, Belgium, at our headquarters in Washington, DC. Jan and Ine are visiting bike advocacy leaders and social entrepreneurs across the United States through an international exchange program through the State Department. They are hoping to gain insights from colleagues in the United States and bring them back to Belgium to grow their own bike education and advocacy programs. Learning about the Mobiel 21 approach to bike education, we heard so many similarities to how our League Cycling Instructors and Coaches think about growing the community of bicyclists in their communities to be accessible, diverse, and inclusive. It speaks to the importance of education and the universality of empowerment, whether it’s a third grader in the United States gaining confidence on their bike or it’s a Somali refugee in Leuven learning bike skills for the first time. As bicyclists, we have so much that unites us across borders--we all appreciate a protected bikeway and hate a car door flung open with abandon in our path. Our biggest takeaway from meeting Ine and Jan, though, is that no matter where you live, you can help your neighbors learn to be more active by bike. And getting people to bike makes people happy. With an outcome of more happy people, who can argue with building a more Bicycle Friendly America (or Belgium)?